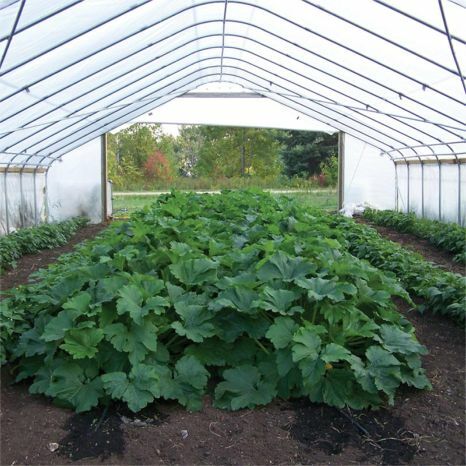 Gothic High Tunnels, with 6'H sidewalls, sufficiently modify the environment to enhance crop growth, quality and yield. Ideal for a wide variety of crops, these high tunnels offer temperature control and protection from wind, rain, disease and predators. New taller high tunnels offer more growing space and increased ventilation! Enhance crop growth, yield & quality. Increase profitability up to 50%. Protect from rain, wind, hail, snow & excessive sun. Reduce labor costs by over 50%. Reduce or eliminate the need for pesticides. Bring crops to market earlier. Provide easy access for tractors. Plant and harvest regardless of the weather. Keep out crows and other predators that damage crops. PolyMax® 5.2 oz., 12 mil thick Clear Woven Greenhouse Covering comes with a 3 year warranty. With added UV inhibitors, this cover has excellent cold-crack resistance and will not tear. Frames are constructed with our 14 gauge USA-made, triple-galvanized structural steel tubing.20 ' W & 26' tunnels use 1.66" OD pipe. 30'W tunnels use 1.90" OD pipe. Unique cross bracing at the top for added strength and durability. Roll-Up Doors, which utilize our Hand-Crank Assembly, and End Panels are manufactured from 10 oz., 22 mil translucent fabric. 20'W units have 16'W x 10'H doors. Purchase 4 x 4s locally to strengthen and finish off the ends. For additional strength and durability, particularly in heavy snow areas, add one of our High Tunnel Rafter Kits. 4'5" sidewalls provide additional, valuable growing space.